The terrifying beauty of ephemera. …as previously discussed by both me and esteemed Swamp Thing artist Steve Bissette. 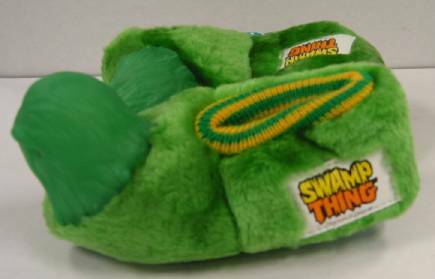 That last pic is a bit blurry, but the card reads “OFFICIAL LICENSED PRODUCT,” in case you were worried someone was out there producing bootleg Swamp Thing slippers. 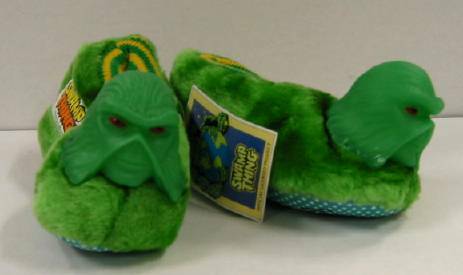 Now, thanks to Pal JP, I now have my very set of these unusual examples of Swamp Thing merchandising history. Yup, a grown man, excited over his ownership of little novelty booties. That’s not weird at all. Kid Chris suggested I get them bronzed, and Employee Aaron wants me to hang them from my truck’s rear view mirror. 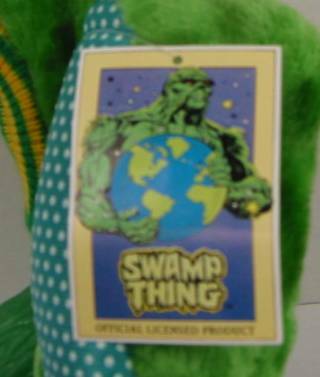 I think I’ll just keep them with the other items in my Swamp Thing merchandise shrine at the house, where just the family will worry about me instead of the public at large.